Conan went up the stairs and halted at the door he knew well of old. It was fastened within, but his blade passed between the door and the jamb and lifted the bar. he stepped inside, closing the door after him, and faced the girl who had betrayed him to the police. The wench was sitting cross-legged in her shift on her unkempt bed. She turned white and stared at him as if at a ghost. She had heard the cry from the stairs, and she saw the red stain on the poniard in his hand. But she was too filled with terror on her own account to waste any time lamenting the evident fate of her lover. She began to beg for her life, almost incoherent with terror. Conan did not reply; he merely stood and glared at her with his burning eyes, testing the edge of his poniard with a calloused thumb. At last he crossed the chamber, while she cowered back against the wall, sobbing frantic pleas for mercy. Grasping her yellow locks with no gentle hand, he dragged her off the bed. Thrusting his blade back in its sheath, he tucked his squirming captive under his left arm, and strode to the window. Like most houses of that type, a ledge encircled each story, caused by the continuance of the window-ledges. Conan kicked the window open and stepped out on that narrow band. If any had been near or awake, they would have witnessed the bizarre sight of a man moving carefully along the ledge, carrying a kicking, half-naked wench under his arm. They would have been no more puzzled than the girl. Robert E. Howard's Conan stories, 21 tales written between 1932 and Howard's death by suicide in 1935, stand like a Colossus in the subgenre of sword and sorcery fantasy that followed. For his supporters, Howard's imagination burned like a meteor through the night sky, brilliant, dazzling, lasting all too brief of a time. 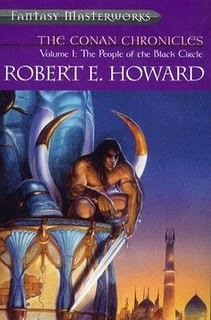 Howard's detractors, however, deplore his seeming chauvinistic, capricious attitude toward women, and they would point to scenes such as the one quoted above as an example of how degrading this form of fantasy literature could be, not just toward women, but also toward the numerous real-world ethnic groups that Howard depicts in very slightly-altered form in his Conan the Cimmerian tales. When I began reading this first volume of two, I had quite a few reservations. Oh, I had heard much about how vivid and "alive" Howard's tales were and that if read as simple adventure pieces, much enjoyment could be gained from them. But I was uneasy about learning of his casual references to "wenches" and his use of racial stereotypes. I feared that I might be in for a reading of a series of stories that, while certainly better-written than the imitative work, would possess the depth and meaning of a The Eye of Argon. After finishing this first volume, my reservations still remain. Howard certainly had a flair for telling an action-packed, vividly-rendered tale in short story or novella form. His Hyperborean Age setting of an Earth tens of thousands of years ago that would serve as a clear mirror for the "distorted myths" that would follow, certainly allowed him much leeway in creating interesting backdrops for Conan's adventures. Depending on what the reader brings to the table, passages such as the long one I cited above can be thrilling, as the villains get their comeuppance in short order and Conan survives to fight for another day. But for those like myself who have certain beliefs in regards to ethnicity and gender relations, Conan's tales present quite a few roadblocks to enjoying Howard's writing. The frequent mentions of naked or half-naked "wenches," many of them chained to slave masters or kings, serving mostly as props for Conan's enjoyment or as a weak-willed, weak-hearted damsel in distress for him to rescue, makes for a rather dated and sometimes repellent world-view that hopefully is fading into the past. I could not, as much as I tried, distance myself from my own views when reading these tales. While I could recognize Howard's ability to tell an exciting yarn, ultimately I was left thinking that most writers (John Norman being a notable exception) who have been influenced by Howard are at least writing tales that invert or subvert Howard's often-odious notions regarding race and gender. Was this volume worthy of being called a "Fantasy Masterwork?" Despite my reactions to elements of his writing, Howard has had too much of an influence on too many writers over the past seventy-seven years for him not to be considered one. Whether or not one might enjoy his writings today depends on the type of baggage that the reader brings to the table. For myself, I can appreciate much of what he accomplished with these tales, but that I have reservations about some of his elements to enjoy them fully. I guess the issue is whether or not women would be treated like that in 10,000 BC, which is around when the stories take place? Anyway, thanks for the review, wenches and all. were you raised by a woman or a man? grow a pair. bo hoo, Howard wrote real, not liberal. No, I was raised by a group of rabid Serbian squirrels, so it does affect me a bit. Besides the occasional bout of chittering, I do find myself hoarding my nuts a bit. As for Howard, I agree that he wrote "real," as in "real crap" for most of his stories. "Liberal" to me, alas, means bourgeois values. I favor the overthrow of capitalist societies and the establishment of Squirrelism in its place.